Ketchup or catsup is one of the popular condiments around. Among Americans, it ranks 3rd only behind mayonnaise and salsa as the thing you put on food most. At least that’s based on sales of each of the products. Often associated with not so healthy foods like junk food or fast food, ketchup may quickly be grouped with these unhealthy foods. In this segment, we take a closer look at whether or not ketchup is healthy or not. What is Ketchup & How Ketchup is Made? In a survey conducted from 2014 to 2015, researchers found that over 93% of U.S. households use ketchup. That’s a staggering majority if there ever was one. Among the different brands around Heinz remained king with close to 60% of the votes. Hunt’s was a far second with 30%, while Del Monte only racked up 7.6% of the votes. 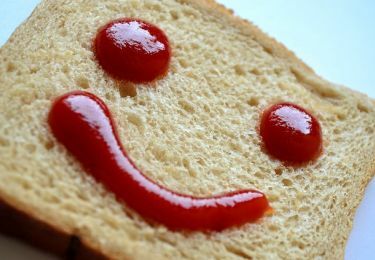 Store brand ketchup fared quite well at 11.5% of people using them most often. 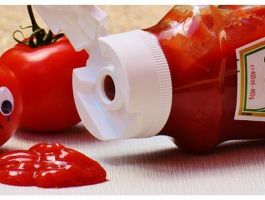 Now that we know exactly how much ketchup and what brands are the most popular in our homes, let’s see what’s in ketchup so we can assess whether or not it’s good or bad for your health. 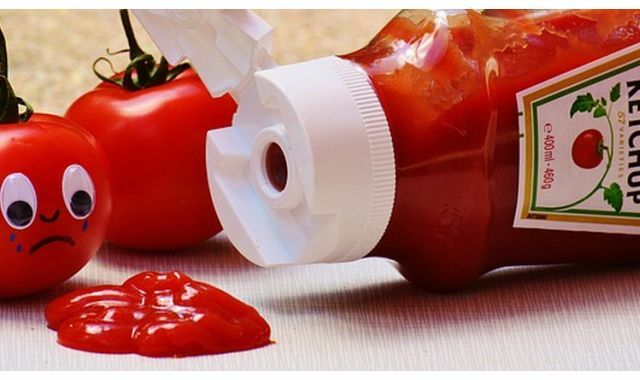 Here’s a video that demonstrates how ketchup is made. Tomato Ketchup in its most basic form is made from tomatoes, typically tomato paste. This is ketchup’s base ingredient and what gives it that rich red color we all know. Then there’s also vinegar, a sweetener and some seasonings as well as spices. Some common seasonings and spices include onions, garlic, cinnamon and cloves. Do note however that depending on the brand of ketchup you get, you’ll find different flavoring used. Also some contain genetically modified corn as well as high fructose corn syrup. Is Ketchup Good or Bad for You? Ketchup is a condiment that most people use with French fries, hot dogs, hamburgers and meatloaf. People also put ketchup on their ham sandwiches, eggs and also potato chips. 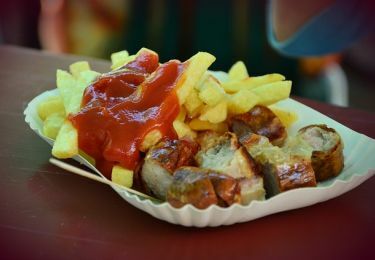 While ketchup is the king of condiments, people often wonder if this substance is good for their health. Some people believe that ketchup is good for a person’s health and other people do not think ketchup is a nutritious food. Let’s examine both sides point of view. Some nutritionists tell us that ketchup should be avoided at all cost. While the condiment does not contain a lot of calories it does contain a lot of sugar and salt. We all know how many medical professionals feel about these two substances. They are evil in the eyes of doctors and dieticians. That’s because majority of people consume them in excess. A teaspoon of ketchup supposedly has 4 grams of sugar. That’s quite a bit considering that the American Heart Association (AHA) places the maximum limit of added sugars per day at 37.5 grams for men, and 25 grams for women. You get over 10% of your sugar limit in one teaspoon of ketchup. Another thing you’ll want to know is that ketchup contains an awful lot of salt. As a matter of fact, if a person was to eat a couple of packets of ketchup on their fries; they would receive all of their daily salt allowance from that one meal (or snack). People who believe that ketchup is bad for your body will tell you to leave ketchup alone or severely restrict its use. Instead, they want people to make their own homemade version of ketchup. After all, ketchup contains tomato puree and paste, vinegar, salt, sugar, spices and onions. These are ingredients that most people already have in their home. If you do have the time, we do recommend at least trying this. It’s definitely much healthier and you can tweak the flavor as needed. Much cheaper too. Here’s an easy to follow guide on making delicious, healthy ketchup on your own at home. If a person makes their own homemade ketchup recipe, then they can control how much sugar and salt they are consuming. The truth is that most people do not make homemade ketchup. They usually just go to the store to purchase a bottle for about a few dollars. It’s just more convenient for most people. If ketchup is eaten in moderation, then its effects should not be a problem. However, consistent long term use of ketchup is probably not going to give a person the best health results. People who believe that ketchup is good for a person’s health make this claim off of the ingredients found within ketchup. First of all, they state that ketchup is a low calorie food and they are not telling a lie. There are only 15 calories for each teaspoon of ketchup and the substance does not contain any fat. Secondly, ketchup contains lycopene which is a cancer fighting substance and it can help to reduce cardiovascular conditions. Ketchup can also help to increase a person’s sperm count, cuts cholesterol and improve a person’s eyesight. It has not been conclusively proven that ketchup can do these things but many medical experts believe that ketchup can yield these results. Why? They look to the ingredients with ketchup and the health benefits that they provide. Keep in mind that if a person wants to lower their cholesterol or improve their vision; they usually do not eat a bunch of ketchup for this purpose. However, eating a normal portion size amount of ketchup could improve a person’s health in these areas. The question must be asked once again, is ketchup bad for you. The answer is no. As long as a person eats ketchup in moderation then this condiment is okay to consume and it will not cause unwanted health problems. Food & Nutrition, General Health. permalink.